The British Limousin Cattle Society’s premier female sale - the Red Ladies Derby - held on Friday 3rd November at Borderway Mart, Carlisle saw the demand for quality Limousin females continue with the keen interest resulting in a high clearance rate and strong averages for all classes of females. Bidding was brisk and this was reflected in the fact that 17 more females were sold on the year. In total, 51 maiden heifers averaged £2101 with 5 cows in calf or with calf at foot averaging £5544 apiece to bring a total sales gross to over £170,000. Export interest was again in evidence with buyers purchasing from Southern Ireland. The sale itself featured a top of 8,000gns for the April 2005 born Ballinloan Alexis brought forward by Stuart Fotheringham, Dunkeld, Perthshire. The Reserve Show Champion and Nenuphar daughter out of the homebred dam, Ballinloan Tigra, this very shapey heifer topped the sale at 8,000gns when selling to James G Porter, Apple Tree House, Craighall Farm, Forgandenny, Perth. Hitting the 7,000gns mark was the Show Champion, Eves Viola, put up by judge Mrs Mary Cormack, Abotts Close Farm, Sutton Rd, Thirsk, N Yorks which went under the hammer to Smiths of Bloxham, Newlands Farm, Milton Road, Bloxham, Banbury, Oxon. Bred by Messrs JW & DN Eve, Stubbsgill Farm, Westnewton, Wigton, Cumbria this served heifer featured Loosebeare Ricky and Lumbylaw Recruit bloodlines and was sold in calf to Nouvelle Prospect. 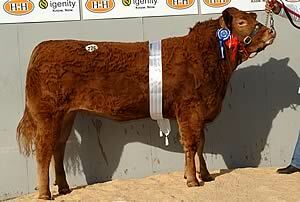 Mrs Cormack was naturally delighted with her choice of Champion and said, “I just love the cleanness of this animal. She is well fleshed and well shown. It’s the job of a heifer to grow into a cow and I think she will do that very well.” The Eves herd has approximately 30 breeding females and this March 2004 born heifer presented them with their first Red Ladies Champion at Carlisle. Smiths of Bloxham continued to build their Ironstone pedigree Limousin herd with the purchase for 5,500gns of Cockshirebeck Abbie, exhibited by Mrs JA Richardson, Whitehead Brow, Mealsgate, Wigton, Cumbria. Another first prizewinner, Sympa breeding was again to the fore with this June 2006 born heifer out of the dam Lumbylaw Petticoat. The red ticket winning Bankdale Amber from Mr G Wilson’s Bankdale Farm, Wreay, Carlisle holding also hit the 7,000gns mark when purchased by Cairns & Burton, Hall Farm, Tollerton, Notts for their newly established pedigree herd. With a Beef Value of LM25, this rising 15 month old heifer was sired by the prolific bull Sympa and was out of the French dam Princesse. Haltcliffe Vivian from Messrs Ridley, Haltcliffe, Hesket New Market, Wigton, Cumbria was sold for 4,800gns. Once more by Sympa and this time out of the homebred dam Haltcliffe Tulip, this served heifer heads to GM Roberts, Myfyrian Isaf, Gaerwen, Anglesey. An Ionesco daughter and out of Scorboro Ormolu, Confluence Vimto was the next leading price at 4,400gns when selling to an undisclosed buyer. Bred by A & GJ Ogg, College Farm, Alkborough, Scunthorpe, Lincs this stylish heifer sported a Beef Value of LM41 and was the first to be offered at auction from the Confluence prefix, being rewarded with a first in her class. A member of the Great Yorkshire Show Junior Interbreed winning team, Spage Vanilla, was offered for auction by William Campbell, 48 Ballyvaddy Rd, Carnlough, Ballymena, N Ireland. Another class winner, she was purchased for 4,000gns by AE & MM Hughes, Brychyni, Llangbi, Pwllheli, Gwynedd who were convinced by the breeding combination of Milbrook R2K, the 2006 Royal Highland Limousin Male Champion, and Newmill Sharon. A super cow and calf outfit from Messrs G&P Blood, Woodhouse Green Farm, Clay Lane, Endon, Staffs went under the hammer for a combined price of 7,200gns. The 2001 born third calver, Woodhouse Sugar, is by Jockey and out of Woodhouse Megan and was bought by A Sayer Jnr, 1 Cresswell Old Lane, Cresswell, Staffs for 3,700gns. Her 10 month old heifer calf, Woodhouse Beth, sired by Goldies Oswald made 3,500gns when selling to Mr B Mairs, 194 Hillhead Road, Ballyclare, Co.Antrim, N.Ireland. A good day’s trading continued for the Woodhouse prefix as they sold two further lots at 3,200gns. Purchaser of Woodhouse Shona, a Marron daughter and out of Jencra Gemma was KI Jones, Bryn Ddaenen, Padog, Betws-y-Coed. Her nine month old heifer calf, Woodhouse Beauty, sired by Sympa made a further 1,000gns. Heading to A & E Park, Harley Rigg, Kirkmahoe, Dumfries is Woodhouse Ursula, a Goldies Oswald sired heifer and out of Woodhouse Ringlet. She was sold in calf to Sympa for 3,200gns.